House fires are not something I want to think about, but they are a real possibility. The National Fire Protection Association reports that there are as many as 400,000 house fires every year in the United States, and 24 Restore performs several fire restoration jobs in Minneapolis and St. Paul each year. It isn’t something we should ignore. With our most valued possessions at risk, the old adage “prepare for the worst and hope for the best” is a good approach. Take precautions to prevent the most common causes of house fires, and consider a home safe to protect key valuables as your last line of defense, just in case. 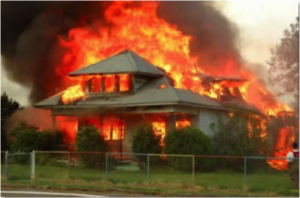 A recent National Fire Protection Association report indicates the most common causes of house fires. Below is that list and suggested precautions. The #1 cause of house fires, accounting for 42% of reported incidents, is cooking. Open flames from the stove and intense heat in the oven easily result in a fire when unsupervised. Most often food or cooking tools catch fire and quickly lose control. While giving up cooking all together may be a bit extreme, paying extra attention and never leaving the kitchen while preparing food is an easy way to reduce this risk. Every winter families all around the world bring large trees into their home to celebrate a beloved holiday. However, Christmas trees can easily become a significant fire hazard. Dry tress combined with strings of lights quickly turn into fire sticks. Before placing the tree in your home cut off an inch or so from the bottom of the trunk, removing any dead wood that would prevent the tree from soaking up water. Be vigilant about watering your tree, keep it hydrated! Also be sure to turn off Christmas lights when you go to sleep at night. Or, avoid the risk altogether by getting an artificial tree! Smoking is the source of many of house fires leading to almost 1,000 deaths a year. Lit cigarettes accidentally dropped on any number of household items can quickly become large fires. Only smoking outside will reduce this risk significantly. An estimated 18,000 house fires are caused by candles each year. Most of the incidents are due to negligence. Leaving a lit candle unattended can quickly lead to a fire. Numerous flammable materials in the vicinity of a candle can easily catch fire. Reduce this risk by trimming the wick of your candle to help limit the size of the flame, or use battery operated candles. Other common causes of home fires include overuse of appliances, home heating systems, and children playing with fire. Faulty or over-used appliances can easily cause a fire with just a few sparks. Heating systems, especially space heaters and wood stoves, can ignite household items nearby. The curiosity of young children can also lead to threatening fires. Playing with matches, lighters, and candles led to 56,300 fires between 2005 and 2009. Keeping these items out of the reach of children and educating them about the importance of fire safety can help reduce this risk. In the event that a house fire does occur a home safe, in particular a fire safe for the home, will keep important documents and precious valuables safe while you focus on getting your family to safety. While we can’t eliminate all potential causes of house fires these are some basics that are well worth keeping in mind. Take these precautions to prevent house fires and consider purchasing one of the many home safes to protect your most important valuables. Safes for the home are an excellent barrier for items of both monetary and sentimental value. If your home suffers fire damage from these or other causes of fire, contact 24 Restore for fire restoration services in Minneapolis and St. Paul.